Löffler's syndrome or Loeffler's syndrome is a disease in which eosinophils accumulate in the lung in response to a parasitic infection. It was first described in 1932 by Wilhelm Löffler in cases of eosinophilic pneumonia caused by the parasites Ascaris lumbricoides, Strongyloides stercoralis and the hookworms Ancylostoma duodenale and Necator americanus. 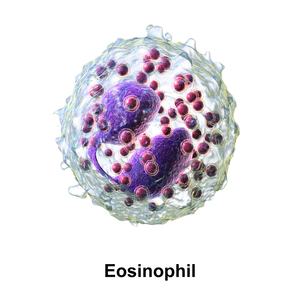 Although Löffler only described eosinophilic pneumonia in the context of infection, many authors give the term "Löffler's syndrome" to any form of acute onset pulmonary eosinophilia no matter what the underlying cause. If the cause is unknown, it is specified and called "simple pulmonary eosinophilia". Cardiac damage caused by the damaging effects of eosinophil granule proteins (ex. major basic protein) is known as Loeffler endocarditis and can be caused by idiopathic eosinophilia or eosinophilia in response to parasitic infection. ↑ Löffler, W. (1932). "Zur Differential-Diagnose der Lungenifiltrierungen. I. Frühfiltrate unter besonerer Berücksichtigung der Rückbildungszeiten". Beiträge zum Klinik der Tuberkulose. 79: 338–367. Löffler, W. (1932). "Zur Differential-Diagnose der Lungenifiltrierungen. II. Über flüchtige Succedan-Infiltrate (mit Eosinophilie)". Beiträge zum Klinik der Tuberkulose. 79: 368–382. Löffler, W. (1935). "Flüchtige Lungeninfiltrate mit Eosinophilia". Klinische Wochenschrift. 14 (9): 297–9. doi:10.1007/BF01782394.